Why Samsung Galaxy Pocket's battery drain so fast? Home » android phones » battery » drain » heat problems » overheating » Samsung Galaxy Pocket » so fast » surface » Why Samsung Galaxy Pocket's battery drain so fast? It allows the applications to sync, send, and receive data at any time. 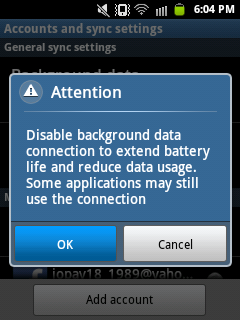 Therefore, disabling the Background data will reduce the use of battery. 3. Turn On your WiFi only when needed. All applications installed on your Samsung Galaxy Pocket that have a privilege to sync on your phone may send an updates or notification. Also, your phone keeps on scanning available WiFi networks if this option is enabled. Turning off this option will save more battery. 4. Lowering the brightness level of your phone screen. normally, lower than 50% brightness level is enough to use during day time. and 35% brightness level is enough to use during night time. It's still up to you on what brightness level you want. 5. Turn On your Mobile data network only when needed. check Use packet data only when you want to internet using your mobile data connection. Unchecking this option doesn't mean that you couldn't receive SMS or calls. 6. Install battery saving application on your phone. I am not affiliate with that app, I just want to share what I have on my phone. You can search battery saving applications on play.google.com then read first what the users review for the app then based on what you've read, decide whether to install it or not. That application helps me to automatically turn ON/OFF my WiFi and Mobile data connection and other stuffs, which helps save the battery of my phone. Why is Samsung Galaxy Pocket surface overheating? The surface of your phone will overheat if you are using it for more than an hour or more. But there are instances that when you leave your phone unused, and then hold it afterwards, it felt hot. This is because at that moment your phone was continuously running and draining your battery. You have finished reading Why Samsung Galaxy Pocket's battery drain so fast? and many articles about Tech Gallery in our blog this, please read it. and url link of this article is https://littlebitjohnny.blogspot.com/2012/10/why-samsung-galaxy-pocket-battery-drain.html Hopefully discussion articles on provide more knowledge about the world of new tech gadgets. Related : Why Samsung Galaxy Pocket's battery drain so fast?